Stream anime episodes online for free, Watch One piece Episode 52 English version online and free episodes. Anime Episode guide One piece Episode 52 English dubbed Buggy’s Revenge! The Man who Smiles on the Execution Platform! Zoro and Sanji show up to late to stop Buggy but a bolt of lightning shows up just in time to cancel the execution. Then Smoker catches Buggy and Alvida and gets on a Dune Buggy to follow Luffy. 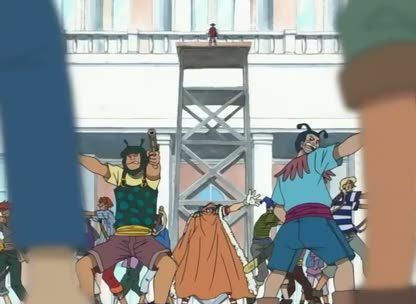 Meanwhile Luffy, Zoro, and Sanji run into Tashigi. Who Zoro fights and beats quickly. Then Smoker catches up and tells Luffy that if he beats him he can go to the Grand Line. And just when Smoker is about to finish Luffy a mysterious man named Dragon saves him. And a green gust of wind lets Buggy and Alvida escape! Then Luffy and company get away and head to the Grand Line! Smoker, Tashigi, Alvida, and Buggy also decide to go to the Grand Line!